A liliaceous pickled scallion has a peculiar, strong smell and sharp taste. This smell is the same allylic sulfide (allicin) as garlic and the leek. It eats with salting, the sweet vinegar pickle, and the soy sauce pickle. The medicinal effect is a lot of health food that is. There is a similar effect to garlic when it eats the pickled scallion. The allylic sulfide (allicin) with a medicinal effect high, peculiar smell is contained. The allylic sulfide (allicin) improves vitamin B1 absorption, and there is working that improves the stream of blood. 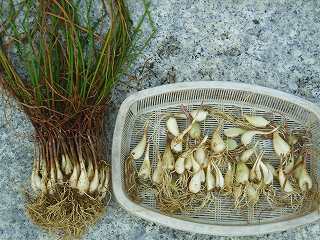 The pickled scallion can be easily grown even in shade and thin land and dry land as long as the drainage is good. It is likely not to fail even if the beginner suitably plants it. The basis of the vegetable growing starts from the preparation for the soil. It does from the compost making if it does by organic farming. If it is a small scale and it is a planter, it is enough also by a soil on the market. You may use the thing marketed as a soil for the flower and the vegetable as it is, and you may mix it with the soil of the field. The pickled scallion is the same as the onion liliaceous vegetable. It is what expands the squama (true part) and became spheroidal. The pickled scallion is planted in around July, put up, and grown. The bud is done up, planted after the squama of the pickled scallion that has been bought in the do-it-yourself store and the gardening shop is taken to pieces, and it puts it. The width of the ridge is adjusted to about 50cm and depth is adjusted to about 5cm by about 5-15cm at planting intervals. You may suitably change around here by your favor. When planting ends, enough water is done. It is called a sick soil, and notes that the injury by continuous cropping happens when the same kind of vegetable is grown at once in the field after the pickled scallion, the spring onion, and the onion are grown. Because it cannot have the seed, the pickled scallion is a plant and is done by the bulge. Weeding is held concurrently about once every two months, and it cultivates when mesne, and the additional fertilizer of liquid manure and phosphatic and compound fertilizer is done. Another need not be done anything because there is no damage by the insect and the animal. In general, the large pitch harvested around next June after it plants it is abundant, and there is Kodama kind that is passed the winter two times and harvested in two years, too. After it had done by about three years, I harvested. It takes time to the following processing though it becomes a small bulb that eats easily because there are a lot of numbers. It processes it at once when harvesting. The pickled scallion discolors to green, and the bud grows when applying it to bright light. The method of soaking at the time of beginning to the sweet vinegar suddenly becomes a delicious pickled scallion pickle though it generally soaks to the sweet vinegar after it salts it. Sweetness and painful can be adjusted like me. The point and the beard root part of the gem are cut, it drops, it expands to the bamboo basket, and it dries it. If a lot of lower side is cut out, it soaks too much and the pickled scallion becomes soft. Next, a dry pickled scallion is put in the disinfected container, the sweet vinegar (The one on the market is acceptable) is poured, it puts, and red pepper are added. It puts on the cool dark place, and it has soaked it for about one month.